The residents of Svalbard may find themselves experiencing above-freezing temperatures for the first time on record, thanks to climate change. Longyearbyen, Spitsbergen, in July 2002. 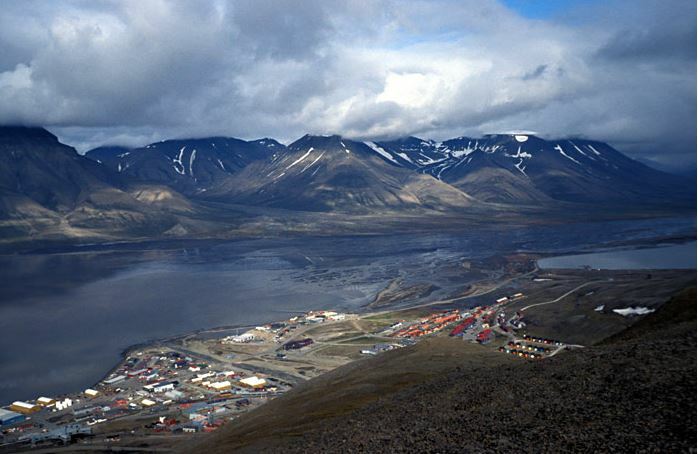 An island archipelago in the Arctic, Svalbard’s normal annual average temperature was minus 6.7 degrees Celsius (20 F). Previously, the warmest year was minus 1.8 degrees Celsius (29 F), in 2006. However, temperatures have been steadily climbing. According to Ketil Isaksen of the Norwegian Meteorlogical Institute, each month for the past 73 months was warmer than the average. The increasing Arctic temperatures are also affecting permafrost and snow cover. As for the sea ice, it is building up much slower than normal. “There are still huge areas in the Barents Sea and Kara Sea to the east of Svalbard that are free of ice. They should normally be ice-covered,” said Isaksen. This decrease in sea ice actually worsens the situation, as it means that more sunlight is being absorbed by the darker areas of the ocean, instead of being reflected back into space. According to a report released by the Stockholm Environment Institute, climate change has caused the decline in sea ice cover and the thinning of the Greenland ice sheet. This in turn affects the stability of the climate and landscape, the survival of plants and animals, and the people's way of life.